With the recent release of iOS 6, Apple claimed to have included 200+ new features. One feature that seemed to slip by most users is file uploads from within the browser. While Android devices had this feature for quite a while, iOS users were left in the dark until now. Uploads work in the same way we’re used to from using iMessage for photos, or other third-party applications like Twitter or Cloudette for CloudApp. As you can see in the screenshot above, this new feature isn’t just limited to Safari; it also works in third-party browsers like Google Chrome for iOS. This new feature will make it really simple for users looking to just upload a file quickly and not have to deal with downloading a new application from the app store to do such a simple task like uploading an image. I’ve run into situations so many times in the past where I need to just upload a file hassle-free, and now I can actually do that. In the past we’d have to come up with complex methods of performing such a simple task. This will really change the way we upload funny images to Reddit from our iPhones. 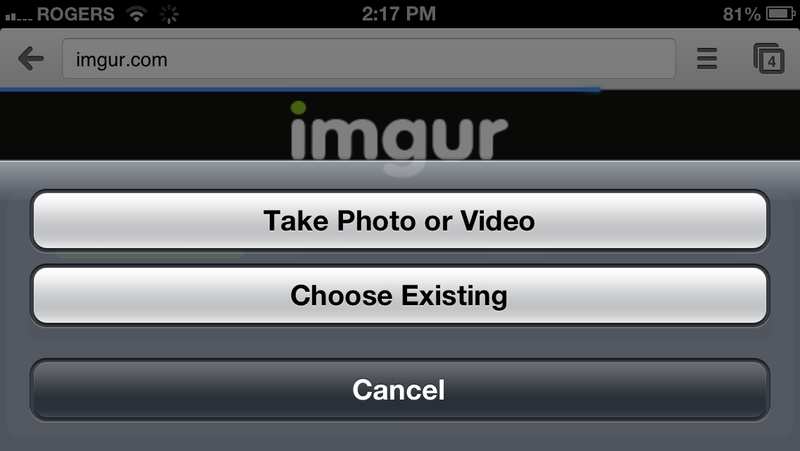 If you want to quickly test this feature on your device, imgur has simple upload page for sharing images online from your mobile device. Simply tap the upload button, and a standard iOS menu will slide up from the bottom and allow you to take either a new photo, or upload an existing one. The image selected will upload just as you would expect from the desktop version, and you’ll be sharing photos of your cat in no time. Previous articleWhat is a Hosts File?